Sun bear best pals David and Dorle have known each other for eight years and still can’t stop smiling when they play together outside. For sun bear Dorle, there is nothing more fun than grabbing her best friend David from behind and trying to wrestle him to the grass, while David can’t stop smiling every time his buddy rolls him onto his back. These two sun bears are old friends, first meeting at Animals Asia’s Vietnam Bear Rescue Centre back in 2011. But it wasn’t until a few years later when their friendship really took off. David has long been known as the most friendly sun bear at the sanctuary showing an insatiable desire for cuddles and wrestling ever since he was rescued as a cub in 2008. For years, his best friend was Lamma, then it was Nelson, until one day in 2013, when he and Dorle hit it off. That day, David was enjoying some rough and tumble with his usual pals when he noticed an eager spectator – Dorle. When David realised he had a new potential play pal the duo enjoyed a long and happy wrestling session. And they’ve never looked back. David was rescued in 2008 while being smuggled by poachers, while Dorle was rescued in 2010 having suffered for four years of captivity as an exotic pet. 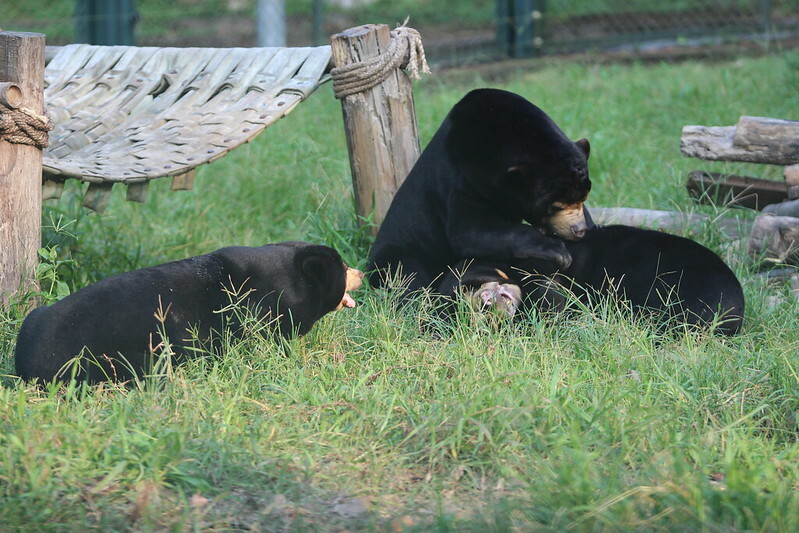 While the majority of the bears rescued by Animals Asia are moon bears, commonly abused by the bile trade, the charity’s Vietnam sanctuary is home to 12 sun bears. These small bears are typically poached for the exotic pet trade although bile extraction is also a possibility.